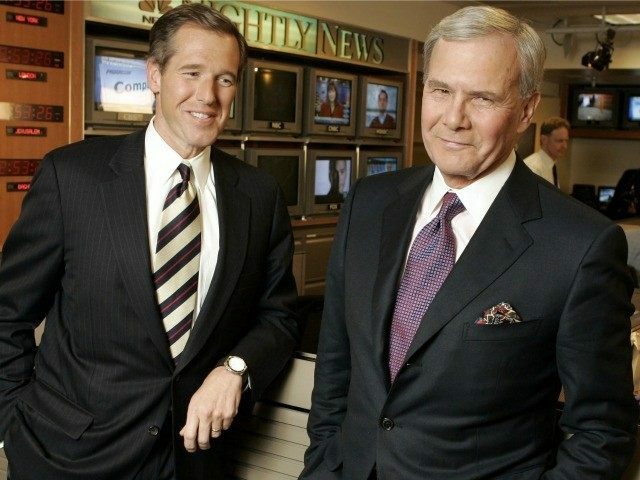 The ground beneath NBC anchor Brian Williams’ feet grew more unstable on Thursday, as the New York Post reports NBC News icon Tom Brokaw is calling for Williams to be fired after he was forced to recant a phony story about taking fire in Iraq that he’s been telling for years. Williams still took the anchor’s seat for his “Nightly News” broadcast Thursday evening — and was working at 30 Rock all day despite calls for his dismissal. He didn’t address the issue during the broadcast. “He is not going to be suspended or reprimanded in any way. He has the full support of NBC News,” a network source said. Many of Williams’ colleagues believe his claim that he simply “conflated” two versions of what happened in 2003. “There have been meetings about it all day. They are taking it very seriously,” the NBC source said. Well, no, they are not taking this seriously if Brian Williams is still there. A news anchor was just forced to retract a stolen valor story he’s been telling repeatedly for over a decade. He’s used that story as a club to batter those who challenged his integrity as a newsman. He used his phony story to needle General David Petraeus about the nature of the Iraqi insurgency. Since NBC dragged its feet instead of doing the right thing and dismissing him immediately, critics have been given a couple of days to dig up more damning quotes and begin asking tough questions about other Williams stories that might have been embellished or falsified outright. Whatever other fine personal qualities and valuable talents he might possess, Brian Williams cannot be a newsman any more. Period. Small children would be able to explain why not to NBC executives. Their excuses for keeping him at the anchor desk have crossed the line into outright insults to the intelligence of their viewers – nobody innocently “conflates” taking a peaceful helicopter ride to the scene of the battle an hour later with getting shot down by a rocket-propelled grenade. If the account of people like Tom Brokaw and top NBC brass keeping silent while Brian Williams retained a story they knew to be false for years (and really, how could they not know? How could Williams tell this lie without the complicity of many other people at NBC News? ), then this network has severe corruption issues that can only be cleared away with the kind of housecleaning that would begin with Brian Williams’ prompt ouster, accompanied by a candid explanation for why the network fought to keep him on its payroll long after the point it was painfully obvious that he needed to go. Until that housecleaning is performed, viewers and advertisers should add Williams’ false story to the disturbingly large pile of outright lies NBC News has told over the years and avoid this network like the plague. The newsmen of a better era would have understood all this instinctively and acted promptly on their own, rather than being dragged kicking and screaming to honesty and responsibility, but such are the times we live in, where the biggest of big shots in media, business, and government don’t feel they should be more than briefly and mildly inconvenienced when they’re caught in flagrantly dishonest behavior.